Once upon a time, California winemakers used a lot of Petite Sirah as a blending variety to give color and body to wines such as Pinot Noir and Zinfandel. In the 1970s, another grape variety with greater 'nobility' was brought to California and today there's considerable acreage devoted to the Syrah grape. With DNA research, it's been suggested that most of the vineyards in California thought to be Petite Sirah are probably a variety called Durif. Evidence suggests a small percentage of California's Petite Sirah vineyards are, in fact, a variety known as Peloursin. 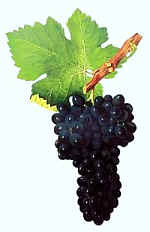 The DNA research suggests that Durif is probably a crossing of Peloursin with Syrah. 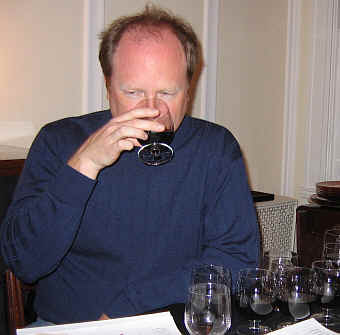 January's tasting host, John McGlothlin assembled a set featuring four wineries, each making Syrah and Petite Sirah. 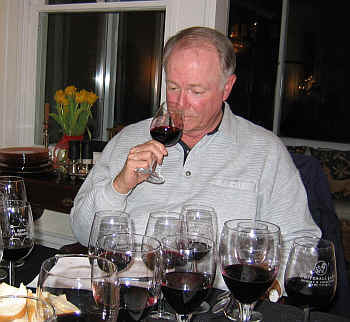 Recalling his youth, John centered the tasting on Concannon Vineyards, a Livermore Valley winery famous for its Petite Sirah in the 1970s. 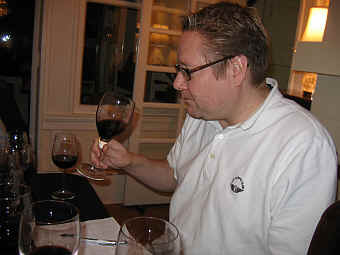 He also included wines from Jeff Cohn's JC Cellars, a top, small winery specializing in Syrah wines. Also in the mix was Ravenswood; today a large winery owned by humungous Constellation Brands company. 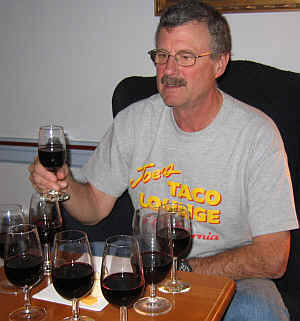 And to keep things affordable, John included wines from the leading producer in California's Central Valley, McManis. One wine outpaced the group significantly and one bottling was well behind the pack. Second place through seventh place were separated by a mere 7 points, so one taster flip-flopping a wine would have changed the standings significantly. I felt the wines lacked "soul" for the most part. Vintners always claim the "winemaking begins in the vineyard" and, for me, these wines showed a lack of quality viticulture. Those in attendance, however, voiced contentment with the group of wines. Clear in appearance and deep purple-hued in color, this wine offers ripe, candied notes with hints of strawberry-like fruit with an herbal undertone. The candied aspect is central to the fragrance and I found this bothersome. It's dry and a bit flat (low in acidity) on the palate. Light and fruity in the mouth, the wine is very simple, standard "red table wine" and of little interest. No stars on my three star scale. This wine was Wine H, the last glass in the line-up. It's 'cousin,' the Petite Sirah, was Wine A, the first glass. 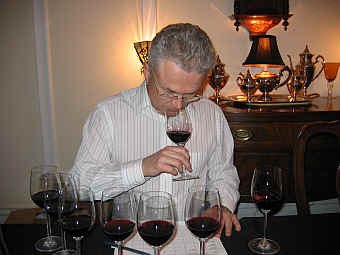 Vino Fino member Tim Zainer has long contended that the first wine poured, Wine A, routinely gets more credit than it deserves. The fact that the McManis wines are nearly identical would lend credence to Tim's theory. This wine is clear and deep ruby to purple in color. The fragrances are oaky and woodsy, showing sweet vanilla...virtually the same nose as the other McManis wine. It's dry and mildly acidic, being medium-full bodied. It's a perfectly pleasant little red showing more oak than anything else. Drinkable now, in its youth. One star. With good clarity, this deep ruby to purple-hued wine had an initial fragrance of ripe to over-ripe fruit. There's a berry jam aroma which, with airing, took on a character reminding me of a plastic or rubber balloon. It's very low in acidity and seemed to be dry. Medium-bodied, this was a dull, boring, mildly jammy-tasting vin ordinaire. No stars. Dark in color, with youthful purple tinges, this is clear in appearance. It's aromas are candied (much like the Syrah from the same winery) with a lightly herbal note. Red fruit fragrances are displayed. This is dry and low in acidity, with medium-full body. It's a perfectly boring, standard quality red table wine. I'm not convinced Captain Joe would be proud of this attempt to honor his memory. No stars. Clear in appearance and deep, dark purple in color, this wine really changed over the course of the tasting. Initially it was leathery and a bit funky, earthy and meaty. With time, the nose blossomed beautifully, showing red fruits and a spice tone with lots of character. Berries and a spice note evolved nicely...I'd open a bottle an hour ahead and splash it around in a decanter. It's dry and nicely balanced in terms of acidity and tannin. It's a big, deep red wine with mild tannins. It seemed to become more bacony and showed some hickory notes after a while. One-and-a-half to two stars. This wine is clear and medium ruby in color...The nose was very quiet and merely vinous. I could detect no particular fruit character. It's a dry red with moderate acidity. Medium-full bodied, it's a tannic, fairly severe little red wine. As with other Ravenswood wines I've tasted recently, I've questioned the tannin levels. This 2004 doesn't strike me as having sufficient fruit. No stars. Deep in color and clear, this wine shows lots of fruity aromas. I found black fruits and some berry-like tones. Eventually it offered a touch of a cocoa-like note. It's dry and mildly acidic, with a bit of a tannic streak. I didn't find it especially well-balanced on the palate and wrote it off as a bit coarse and astringent. No stars. Clear in appearance, this wine is dark in color with purple hues on its robe. There's the McManis signature oak on the nose, with lots of vanillin and espresso-like fragrances. It's dry and medium-low in acidity. Medium-bodied. Lots of coffee, mocha and espresso-like flavors. I couldn't tell you what grapes went into this wine, but it's a good example of today's made-for-the-market red wine. One star for its style...drinkable now.